Lucky for me, I arrived on a Saturday during a lull in the lunch service. It was between lunch and dinner and so I had the place to myself and took as many pictures as I’ve liked without bothering other diners. By the time I got to my main course though, the restaurant had filled up and there was a waiting list! So if my colourful pictures make you want to have your next meal over at Triangle, make sure to call before you go to make sure there are available tables. Waiting list I tell you! The moment I was handed the new menu I’ve asked about their “freakshake”, which is the colourful messy medley in a jar you’ve seen above. Yes, people do enjoy such messy colourful concoctions especially if they had a free day from their diet and let me tell you, it was cold and sweet and good and the colours alone made me giddy with happiness, it induces the same feeling you once got as a child going to a fun fair and having a big pink puff of cotton candy to tear and chomp on. My only regret is that I didn’t get to drink it all, and most of the cream and sweets were wasted. I did suggest they make it on a much smaller portion. 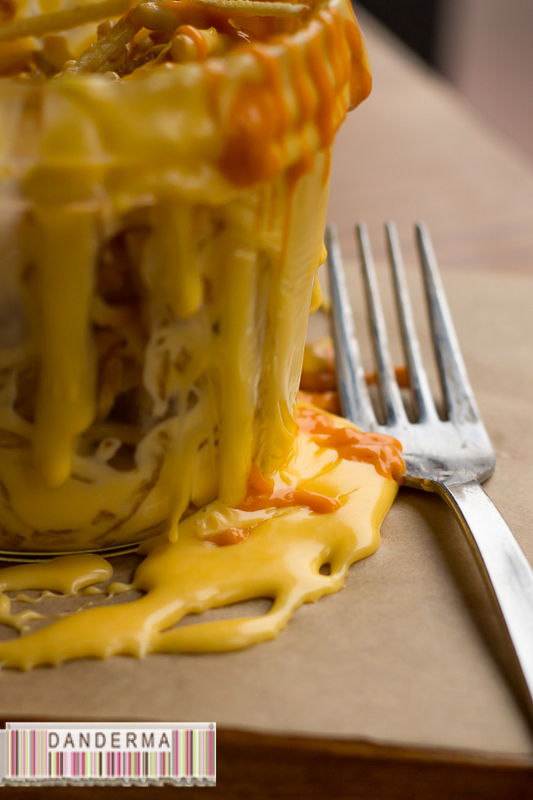 The volcano of cheese and potatoes? From the very beginning of the post? Yes, well, it was the second thing I’ve chosen off the new menu. 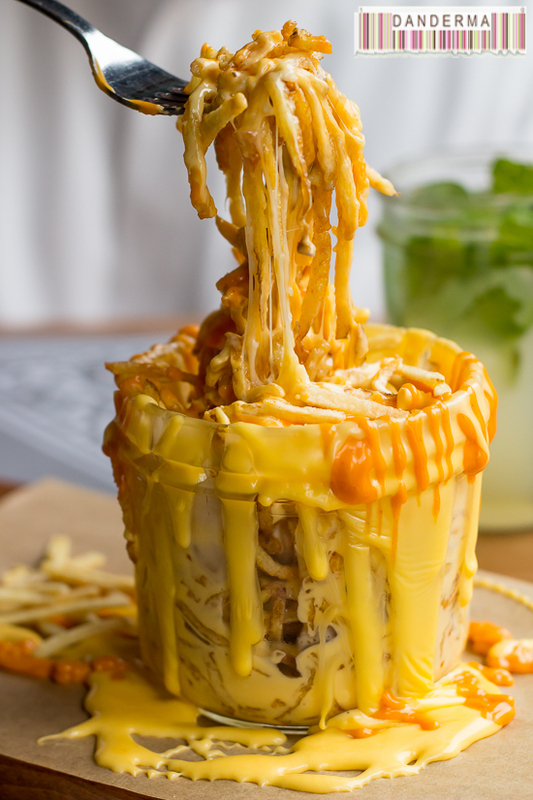 Its called the “Smoked Jar Fries” and its, well, a jar of matchstick fries swimming with two kinds of cheese alongside smoked chill beef and spicy sauce. I don’t do spicy, I don’t do beef, but there was nothing on earth powerful or spicy enough to keep me from digging my fork into the top of the cheesy starchy mess and pulling out forkfuls of fries, hiding them away in my happy stomach. The very top of the jar had no chilli nor spices, lucky me. I managed to stop myself before both made an appearance that made me regret my lunch. That dish is a MUST. 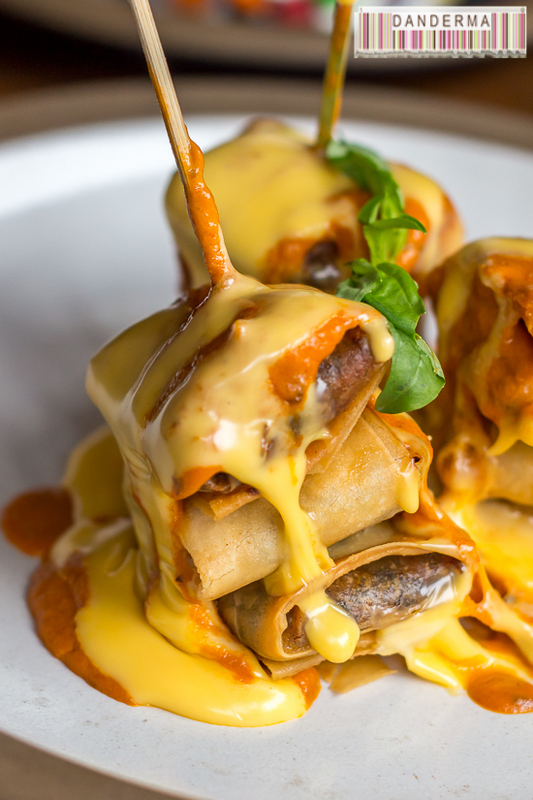 The next dish from the new menu’s appetisers, the mushroom pillows, gave me mixed feelings. The cheese sauce was really similar to the one from the smoked fries jar so it was a bit on the redundant side and the parcels of the filo with Shitake mushrooms were nice but overshadowed by the lovely matchstick fries. If you decide to order it, either make sure you are a big table ordering dishes to share or don’t order the jar of fries with it otherwise it won’t do it justice. When I informed the restaurant manager that I was a vegetarian, I found this tower of eggplants landing on my table. 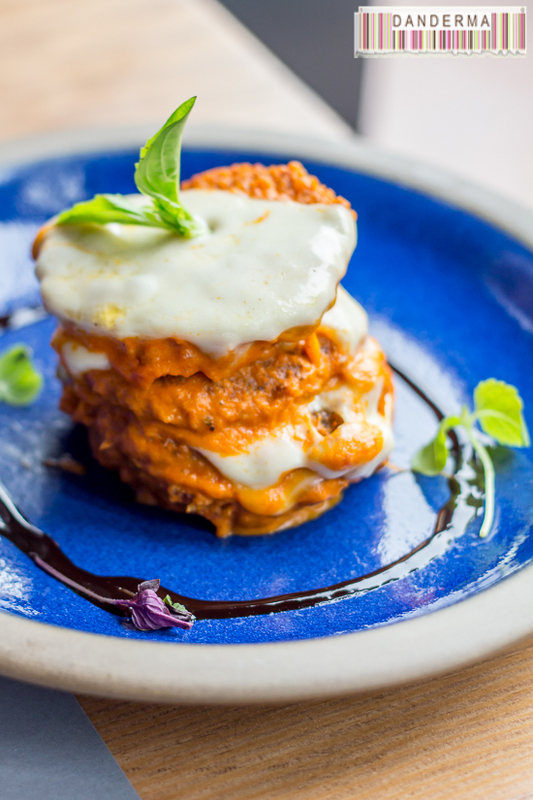 It is very similar to a melanzane parmigiana, with discs of crumbly fried eggplant coated with a delicious tomato-y sauce and cheese. There is a reason only one lone picture of this dish managed to survive and that is because, well, I was too busy attacking it to take any pictures. If you are looking for a nice vegetarian main or appetiser, this is the one. 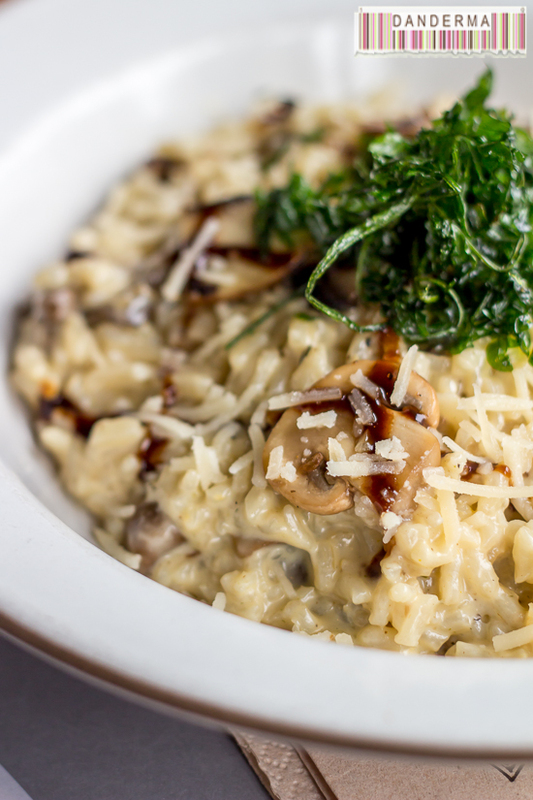 My original main dish was the mushroom risotto. It was very nicely done indeed and hit all the right spots: mushroomy, warm, wholesome, creamy, and with plenty of parmesan and what I suspect is crispy kale as a garnish. The mike is now handed to my carnivore of a husband, who decided that for main dish he is going with a dish called “Shot the ribs”. The word shot come from the Espresso shot this piece of rib meat was marinated in before being cooked to order and served. 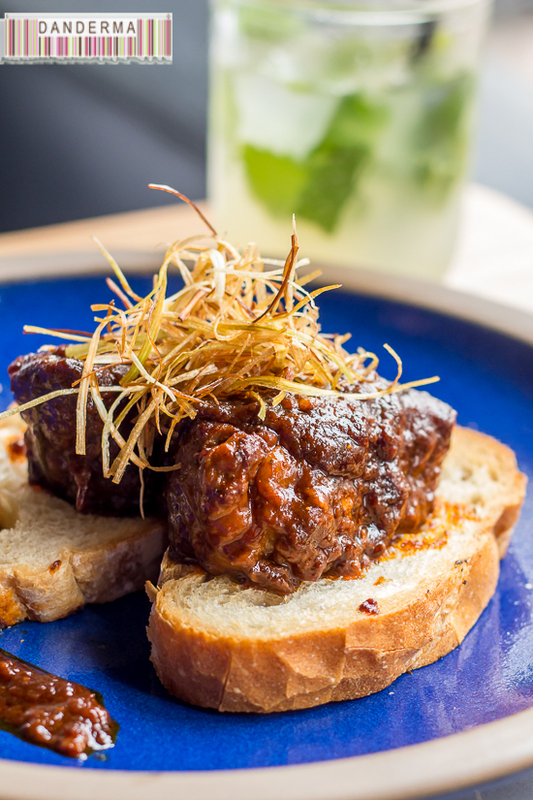 Coffee-loving carnivores would love this dish. Well, my husband adored his piece of meat and even I could see that the meat was falling off with a touch of fork and disappearing before I could blink twice. My only comment would be it would have been nice if the dish was accompanied with something other that the two slices of grilled baguette slices but no one is stopping you from ordering that jar of smokey cheesy fries on the side to go with it, which is what I’m planning to order the next time I’m there for the other carnivore in my life, my sister who loves meat so much she must have inherited my missing meat eating genes. Dessert time! Believe it or not, we tried to object to dessert because we were already too full from lunch. 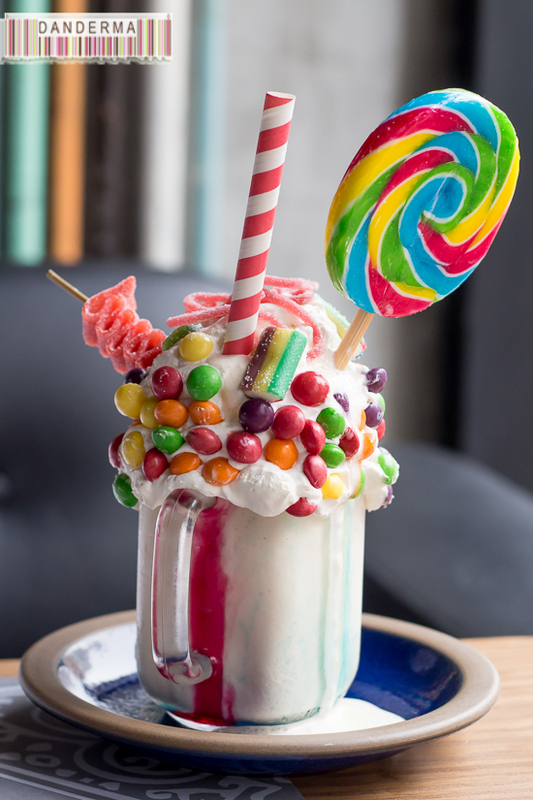 The generous management of Triangle wouldn’t take no for an answer and not only did they serve us dessert, but another new milkshake concoction as fun and colourful as the first! There I was thinking about cotton candy and et voila! 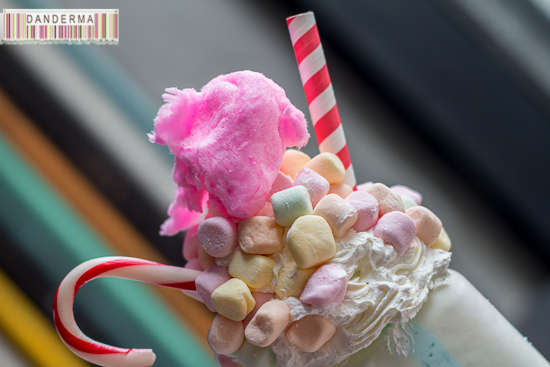 Mini marshmallows and cotton candy made an appearance together alongside pieces of candy cane! This shake gave another day-out-in-the-fair feeling when I saw it and I did manage to finish off the piece of cotton candy on top but I have to say, the first milkshake was tastier. 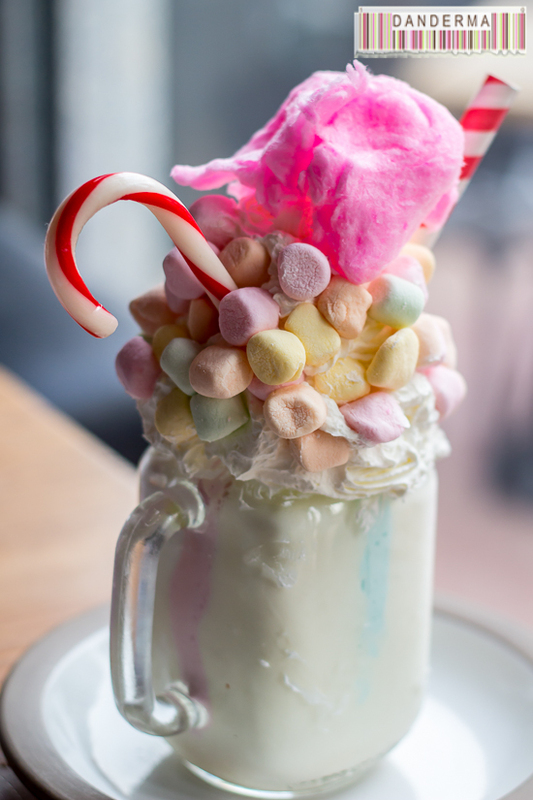 These two milkshakes are not to be taken lightly, they could be a meal on their own and a very naughty one indeed. 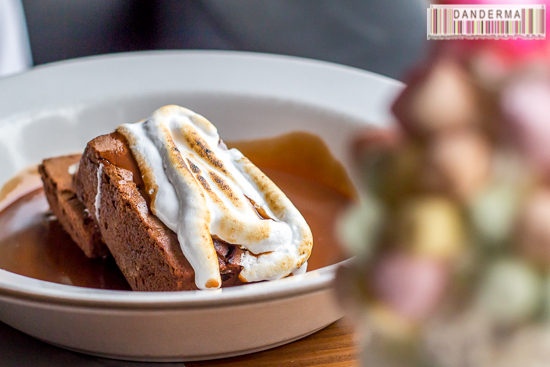 Behind the mounds of whipped cream and mini marshmallows, this plate of chocolaty dessert was placed. 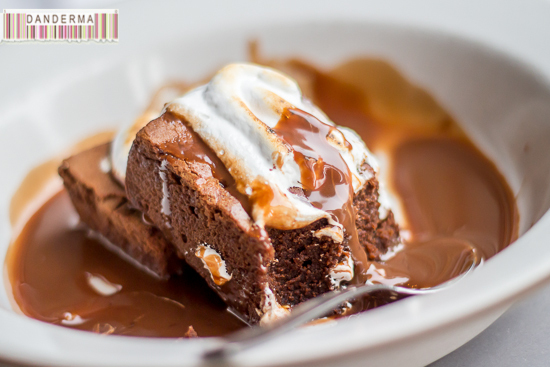 First came the plate with two pieces of brownie and burned meringue on top. Next, a bottle of chocolate sauce was conjured up from no where, and the sweet chocolate sauce was flowing freely all around the brownies, bathing them, soaking them, and making my mouth water despite my protesting stomach. 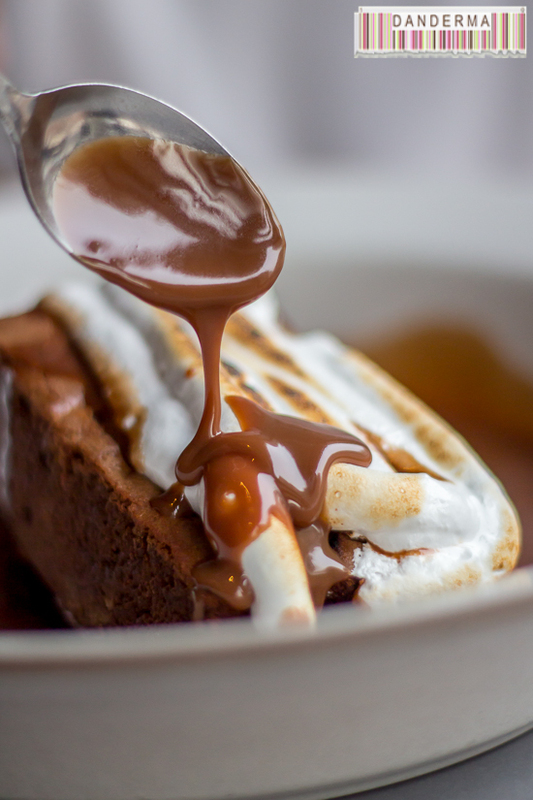 Should you have enough room left in your stomach, try this chocolatey dessert and you won’t be sorry. 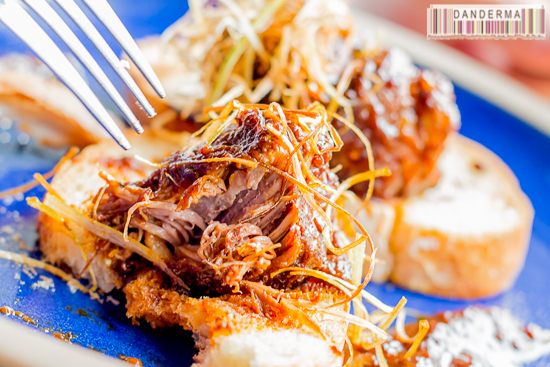 After a couple of hours and what seemed like the entire menu, we looked around and realised we had an excellent time. The place was buzzing with diners and people were waiting to be seated. You know when you have a meal at a restaurant and you are enjoying your times to the point of being too relaxed and reluctant to leave? I didn’t want to leave. I wanted to order a big fat mug of American coffee and nurse it till closing time while nibbling away at the chocolate brownie above. 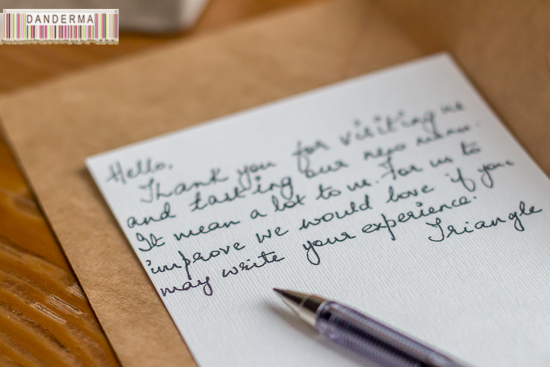 Alas, it was time to go and time to give my feedback on the new menu items I’ve tried. Thank you Triangle Restaurant for the delicious lunch. Excellent food, gorgeous interior, cool soundtrack, perfect atmosphere, and really good service. 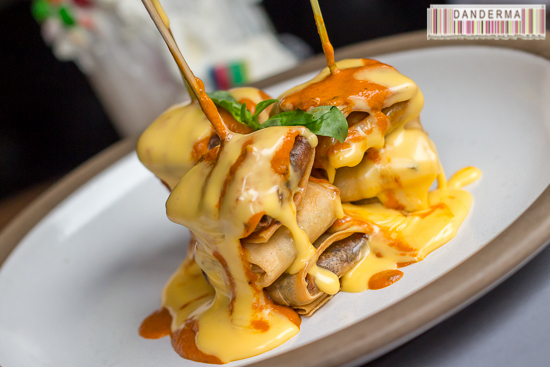 We enjoyed every bite and we will be coming back for sure to try more dishes from the new and quite fun menu. Triangle Restaurant is located in Kuwait City, Ali Al-Salem street. For more information, pictures, and directions check out their Instagram account (@Trianglekw) or give them a call at +965-50838483. How have I not heard to this place before!? Those artery clogging dishes are my type of food! I mean, if I’m going to eat out, it shouldn’t be for a bloody salad right? They’re on talabat too. Thanks! Lool! Exactly! If you are going out, why not get something you don’t get everyday! But not everything in the menu is available through talabat btw. In the winter time the outdoors seating is also cosey and gorgeous.